One hundred students from Piner High School located in Santa Rosa visited Sonoma State University on March 27, as part of a STEM (Science, Technology, Engineering, Mathematics) initiative between Piner and the SSU School of Science and Technology. The initiative provides a pathway into SSU for Piner students. Those who go through the STEM program and meet certain benchmarks receive early admission into SSU. This is all part of an effort to get more students into much needed STEM majors. "STEM majors are vertical and require a good deal of pre-requisite courses from high school, especially in math. If high school students are thinking about a career in a STEM field, the sooner they realize it, the better off they are," says Jeremy Qualls, physics professor at SSU "It also is important to foster a positive attitude towards science in hope that we can attract more majors and show students it's not scary. The United States is already struggling to produce enough qualified STEM majors to meet the nations needs." The students participated in various STEM activities and lessons taught by SSU professors that incorporated a specific major offered at the university. 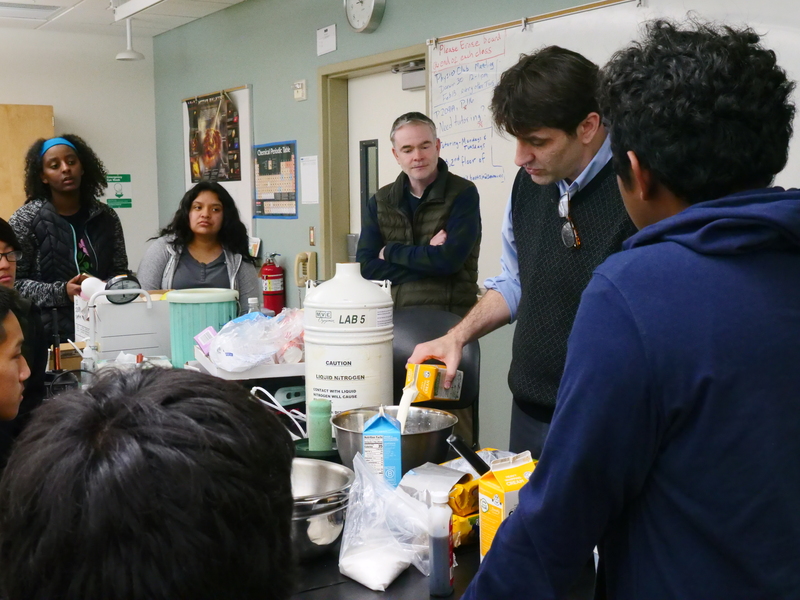 Students participated in dozens of activities that ranged from making homemade ice cream with liquid nitrogen, exploring with Virtual Reality goggles , learning how a glowsticks work, to even playing a game of Nursing Jeopardy. "I enjoy knowing that I am making an impact on these students. When I was a child, my parents would take me to the open space observatory put on by the Physics department here at SSU. These trips helped to make science more real for me, says Steven Farmer, chemistry professor. "I am happy to say when I became a professor here at SSU, almost 30 years later, I was able to personally thank the faculty member, Gordon Spears, who ran these events. It makes me immensely proud to now be the one inspiring future scientists." Students not only asked questions about the major and the experiments at hand, but some questions even stumped the professors. "After my chemistry talk, I think many of them are supersized when they find themselves excited by science. I subsequently get barraged by the most interesting and funny questions, says Farmer. " 'Will explosives glow under a blacklight?' 'Do they add chemical whitening agents to milk?'. These were actually very interesting questions that I didn't know the answer to. Being a curious scientist that I am, I will definitely be looking up the answers."